Rebecca Lozer photography: First Look ... we cheated a little! First Look ... we cheated a little!
. . . The First Look . . .
. . . it started as a trend and has become something so much more! When asked by my fabulous brides and grooms what is better . . . I simply ask what they want. Some couples choose to see one another before the ceremony and some do not, while others just have a timeline that won't accommodate photos after the ceremony. There are many reasons to do or not to do a first look. But here is what I personally love about them. A moment between the bride and groom exclusively . . . yes I am there to document it (hiding in bushes and climbing trees lol), but it is such a private and intimate moment shared just between them. 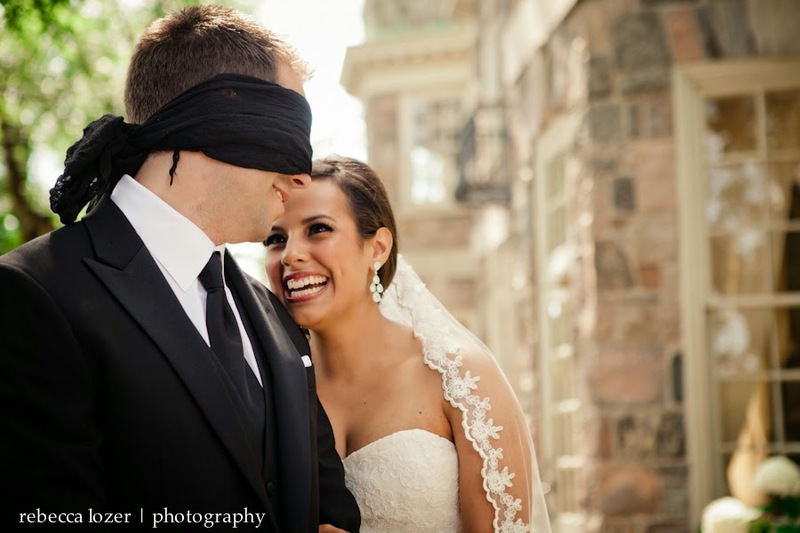 Whether your groom is blindfolded or not . . . the emotion still rings true. Theres always tears and or laughter . . . some stumbling on words and a sweet embrace. With no one watching they are free to have their moment together. Don't get me wrong the moment coming down the aisle is very powerful as well . . . romantic and shared with everyone. Great candids of parents and guests are captured as the bride graces us all with her presence. A room of guests sitting on the edge of their seat in anticipation. I would never sway anyone one way or another . . . every part of a wedding is unique and special! Here is a fav moment from 2013 . . . this was a 'not' so first look . . . still cute, fun and we had a great time with it! Talk to each other and decide what you would want for your day . . . while there are many decisions to be made . . . this one should be one of the most exciting ones! The Storm is Brewing . . .